Sunny and 30 degrees cold today. 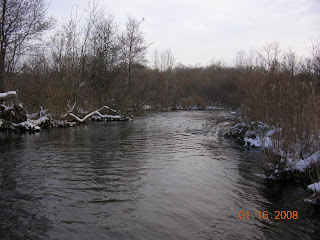 Winter is supposed to return the next few days, so I grabbed my 5wt and headed to Augusta Creek to look for a brown trout before it gets real cold. When I got to the river I tied on 2 small nymphs and quickly proceeded to loose them both in the tree behind me. Tied on 2 more and began fishing. 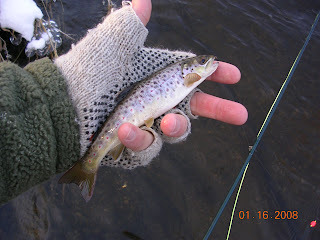 In the first small hole I landed the small brown pictured below and lost another at my feet. Not a big fish by any means, but it still felt good to get on the river and hook up with some fish, especially in January. I proceeded to work my way upstream, back to the truck. Fished copper johns, pheasant tails nymphs, and san juan worms in the deeper holes and bends.